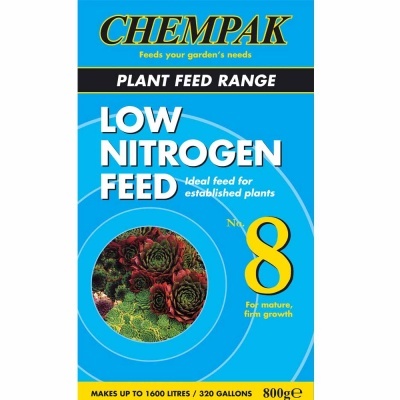 Chempak® No 8 Low Nitrogen Plant Food 800g Carton provides a healthy feed for heathers, conifers, bonsai and other plants, ideally applied during the Summer. Fully soluble lower nitrogen plant feed encourages mature plant growth. Containing 7 essential trace elements that deter serious disorders (possibly found if feed is absent). Chempak No 8 formula has a lower nitrogen content, but offers extra phosphate and potash, which matures growth and encourages a firm ripe finish to onions, leeks and other vegetables. Being fully soluble this ensures the feed gets to work instantly when needed. Ideal for use on: Alpines, delphiniums, sweet peas, bonsai, heathers, onions, cacti, lawns, leeks, conifers, orchids and runner beans.